While updating your computer to Windows 10 there are lots of issues may appear and affect the entire system, in my previous blog we have already discussed how to deal with Fix Error “No audio Output Device is installed” that appearing after upgrading to Windows 10. 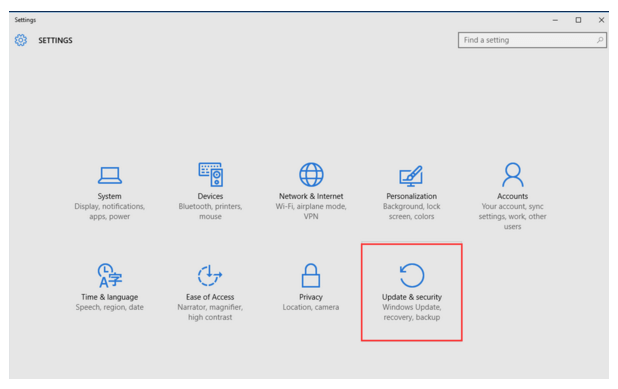 There are several other update issues like no Wi-Fi on Windows 10, no sound after the update, black screen for Windows 10, and the display problems are the common issues of Windows 10. In this article, we will discuss on the display errors after Windows 10 update. First make it clear that display card is also known as the video card, display adapter, video adapter, graphics adapter, or graphics card; so don’t get confused between these terms. An error message “You may experience problems with the display” appear when installing Windows 10. The output of system’s display crashes after Windows 10 automatically updates the Nvidia graphics card drivers via Windows Update. After upgrading to Window s10 you will get poor image rendering. You will face stuttering issues when playing video games on Windows 10, especially when playing 3D games. Unable to detect GPU after Windows 10 update. The GPU driver is not working properly after upgrading to Windows 10. Microsoft also warned about the issues with an Advanced Micro Devices (AMD) graphics, no matter you are using the Intel (R) HD graphics card, the Nvidia graphics, or the AMD Graphics. In order to fix this Windows 10 display/graphics issue, you need to repair the graphics driver such as Nvidia graphics driver, GPU driver, Intel HD graphics, AMD graphics or any other. The main causes of these issues are, upgrading to Windows 10, as it will remove anything that is not compatible with it, as well as system drivers. So that, if you are getting graphics issues then it is because of the lack of the graphics driver, corrupted video driver, damaged or missing system graphics driver. Windows 10 updates may also conflict with Nvidia’s driver system and trigger the display issues because of Microsoft’s mandatory update policy for Windows 10. 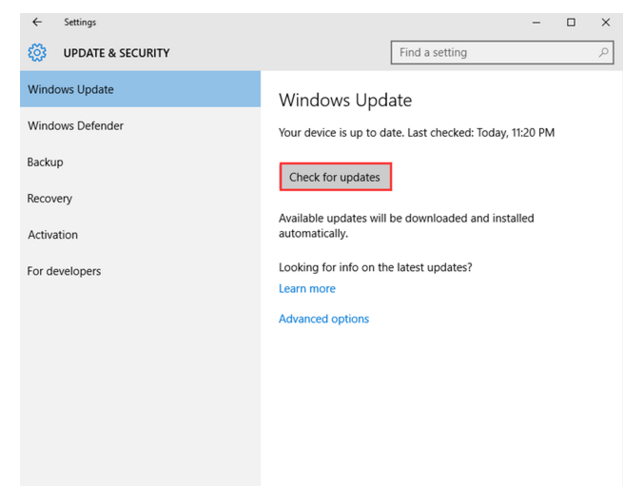 Go to the Windows Update and install package KB3073930 while checking the “prevent the problematic driver or update from reinstalling automatically the next time Windows Updates are installed” box. According to the several users, after downloading the Windows 10 Fall Creators Update they are facing stretched screen problem or screen resolution issue. Step 1: First, you have to open the Device Manager, press the Windows + X and choose the Device Manager. Step 2: Click on the Display adapters to expand it and double-click on the currently active display device. 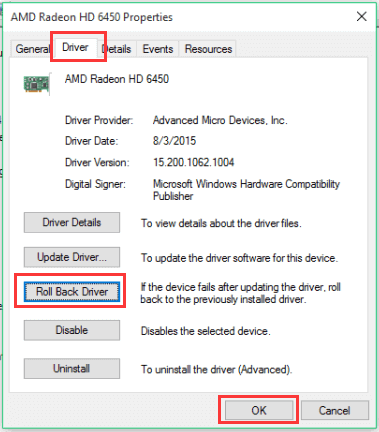 Step 3: Click on the Driver tab and then click on the Roll Back Driver button. Step 4: Click on the OK button and reboot your computer. Step 1: Go to the Control Panel of your Windows System. Step 2: Click on the Device Manager and expand the Display Adapters category. Step 3: Find out the name of the Graphic card driver and then right click on it then select the Update Driver Software option. Step 4: Then, click on the Browse my computer for driver software. Step 5: After it, click on the Browse option and then go to the path where you had downloaded the driver file. Then simply follow the on-screen instructions. Now, the system driver will be installed successfully on your system. Check for the display issue in Windows 10. Step 1: Click on the Start button and then go to the Settings option then click on the Update and Security. Step 2: From the left pane, click on the Windows Update option. Step 3: Again, click on Check for Updates option. Windows will search for the latest available updates. Step 4: Now, you will see a link – optional updates are available. Click on it, but if this link doesn’t appear then your Windows system couldn’t find any updates. Step 5: At last, choose the required driver and then hit the Ok option. Click on Install updates. If you want to make your system fast and error free then you should use a professionally designed PC Repair Tool. This application is one of the best and effective ways to maintain your Windows system. This software contains an easy to use interface so that one can easily operate this tool without any need for professional skill. Simply download and install this tool, it will automatically scan your PC/laptop and fix all the errors. This app also provides the facility to fix driver related issue, it can update and fix any error related to the system’s driver. So, it is recommended to use this software and enhance the performance of your old computer. How to Fix Msvcr110.dll Not Found or Missing Errors?